This week, we're talking NKOTB and THE CRUISE! Listen in as Brooke & Nikki read stories from two NKOTB cruisers Jennifer & Courtney...then we talk "Rock This Boat" as we share a Q&A with Jessica from season 2! Seriously - you guys - you won't want to miss this! My sisters and I went on the 2014 cruise to celebrate their 40th. We had been going to concerts since 2008, and I won a meet and greet in July 2013, which started the bug! We told our husbands it would just be once. We had so much fun, and in the long rainy taxi line in NYC, we met a girl who commented on our KC Chiefs shirts. We exchanged Facebook, etc and then went to see Nick and Knight in KC that September! We ended up hitting it off with a great group of crazy fans who all live in KS and MO! When the 2015 cruise was announced, we convinced our husbands to let us go again! It was a totally different but just as fun experience! I even got on stage on 80's prom night when Donnie noticed I knew all the words to Bob Jovi! We were also dressed from the TV show MASH, which Joe was too and we got on the big stage! It has been spectacular! No 2016 cruise, as life happens, but we went to the KC show in June 2017 and travelled to Boston as a group of 9 girls to see them at Fenway! What a blast! My favorite thing about the cruise is getting to take off my "Mom hat" and enjoy being together with my wonderful friends and reliving memories with NKOTB! 1989-now! So I heard on your last episode that you were looking for cruise stories so here I am! A little background about me: I’m late to the new kids party as I didn’t get into them until 2008. My first tour was the package tour in 2013. Needless to say after seeing Mr. Wahlberg take his shirt off , I became addicted. (If you haven’t figured it out, I am a Donnie girl but how can you not be?! ) So in 2015 my best friend and I decided we had to get on that boat. Problem was, we couldn’t really afford to buy tickets so we entered the raffle. We did not win (insert sad face here) but we vowed that the following year we would go, no questions asked. We had only met the guys collectively as a group once prior to the cruise (we met had met Donnie and Danny before, but those are stories for another day) so we were very excited to get on the boat. Being on the cruise is a bit different than a regular cruise I would imagine as there are 3000 girls there for the same reason you are… to fangirl over those five guys from Boston. Walking around the boat and seeing everyones door decorations was a highlight. The deck parties are INSANE! You don’t realize just how many people are on the boat until you get out there. The guys are on stage having a blast, crowd surfing and keeping everyone entertained. Everyone is dancing and happy and just enjoying being there. It makes you forget about the real world for a while. My favorite night of the cruise was the last night, GPS night. We got a spot on the lido deck right up by the main stage where the guys are. We got to help them crowd surf back and forth to the stage. Donnie grabbed my hand on the way back to the main stage from crowd surfing and I squealed like a 12 year old. I could’ve gotten off the boat right then and been happy but it got better. 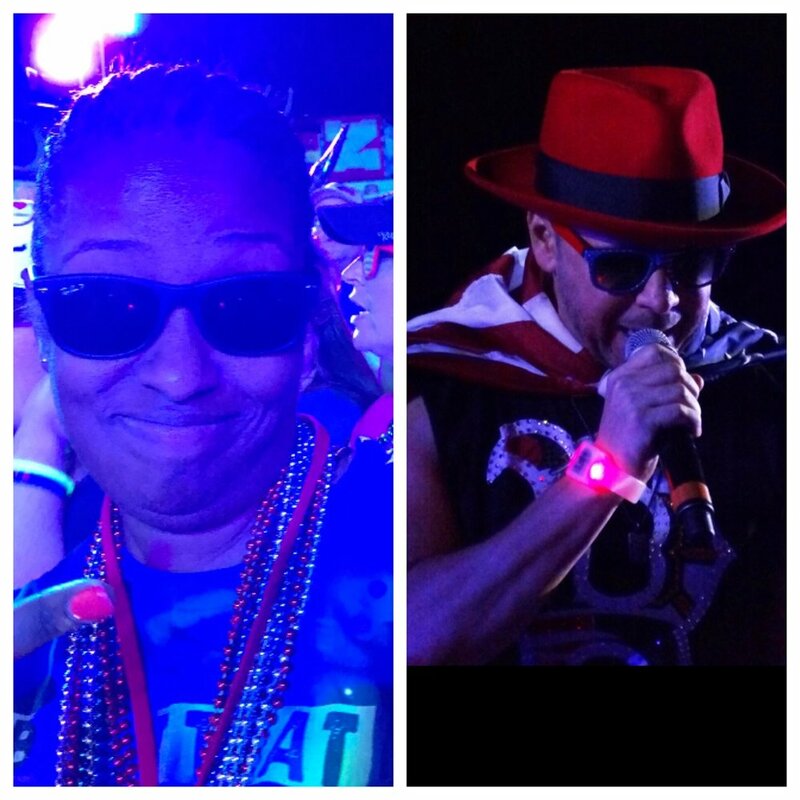 So Donnie is on stage (it’s probably 2 or 3 in the morning) I have on these red white and blue shades . Because he’s in such proximity to me (and I thought they would go well with his ensemble) I decide to take them off and give them to him and he took them! About maybe an hour or so later he is handing me shades back and I am thinking he’s giving mine back to me so I say no that’s okay and he says… no they are mine. So of course I took them! Yes that’s right girls , I own a pair of Donnie Wahlberg’s shades! That night made me love him even more. He stayed out on that stage until he was being asked to leave because they had to clean the lido deck. Aside from the fantastic moment with him, I got to share that night with my girls. We laughed , we cried, we danced, it was amazing. This blockhead thing is like no other. It opens your world up to so many experiences and people that would have never been put in your life if you didn’t enjoy the same band. Crazy isn’t it?? Anyway, that’s just a glimpse into my experience. Needless, to say I am going again this year! PS. I hope you ladies get on the boat, I’d love to meet you!! I also included pics, me wearing his shades and him wearing mine. I've been a NKOTB fan since way back when was I was a kid. My aunts would babysit me and always had NKOTB music on or we would watch the Hanging Tough VHS! I remember seeing posters in their room one loved Joey and the other loved Donnie so my favorite was Jordan but I was to young and really just enjoyed the music. I started with the posters on my wall as I got older and by then it was more NSYNC and BSB. First concert was a NKOTB concert, I remember having the NKOTB Birthday decorations, bedding set, dolls, lunch box you name it all the cool merchandise I wish I still had! This Christmas album was a big hit every holiday and still is. I have now passed on NKOTB and their music to my cousins who our under the age of 21 who know everything about the group...thanks to me lol! Who’s your favorite New Kid - and why? Favorite New Kid of course is Donnie!! I love him and the Wahlberg family. Love his lovely wife too Jenny McCarthy Wahlberg. I must admit Donnie's "bad boy" image back than did scare me but when they reunited that "bad boy" image wasn't so scary haha. But I love the whole group really they all have a little something that makes this group better than any group out there! Do you have a NKOTB non-cruise related story to share? If so - please feel free to share it here! NKOTB tour related? One of the shows a few years back (before RTB) I bought two tickets and dragged Augie along he is always down to have fun with me and supports me. He had a blast and didn't know we would have Donnie so close to us as they came out to the crowd. Augie was recording and taking pics for me as I danced and had a blast like a 10 year old little girl again. NKOTB was playing "Single" and Donnie sang his part into the camera I was so excited to have that memory on my camera. Who would think years later we would've booked a cruise with the group! I didn't expect anything to happen when I saw the post online but I figured why not try? Right? I've never met the guys before and I figured maybe this is my chance. When I told Augie I sent a email he just laughed and said I was crazy...little did he know we got a reply back! My mom always says to me "never say never, or "you never know until you try" (anything can happen blah blah) but this is all TRUE! I would go to shows in our area never did the VIP Experiences or anything like that so when we found out we were picked we couldn't believe it. Did you receive compensation for being on the show? A cruise discount? Yes, being on the show you do get paid. They flew us out to NYC to do part 2 of the show which is the green screen interviews. No cruise discount but what happened on the finale with Donnie did happen. Before you were on the show, had you been on the NKOTB cruise before? No, we have never been on any NKOTB cruises...I would look up the prices and never book until one year I said to myself screw it I need to go on at least one NKOTB cruise! I remember watching videos on YOUTUBE and showing him saying I need to do this just once please. November 2014 Ill never forget that day. I had the down payment ready. I didn't care what room we booked, I just wanted on that boat! Do you feel that there was any backlash from the BH community after you were on the show? Did you receive any negative feedback? How about positive feedback? It is a "reality" show so people do tend to forget we were just fans taking a chance to have a once in a lifetime experience. It makes me sad for the negativity but on the bright side we had a blast and wouldn't change any of it. It was a risk we took and knew it came with the package deal and it was totally worth it. We have met so many amazing people who we can now call our friends and have had some awesome experiences we will never forget. For example I've never been to NYC before and because of the show it has allowed us to take chances and go to places we probably would of never traveled to before if it wasn't for the show like Chicago for the "Go Home With Donnie Event", New Orleans for the cruise or even Pennsylvania for Mixtape. How often are people trying to get close to you because they think you might have a connection to the group? Augie- "All the Time." We don't try to think of it that way though. We do like to see others have a experience with any of the guys from the band who have never had a "moment" We are blessed for opportunity and moments we have had. One time we got to squeeze in A Total Package Show concert at a different state in June we had 2 extra tickets, nice view near the stage. So Augie went to find someone who was sitting in the last row of the arena. He found a mother with her young daughter he told me how happy they were and it brought tears to our eyes. That's what is all about. When all this happened to us on the show we couldn't believe it so this is one of our ways to give back. We will always be forever thankful. How much input did you have on how things went down, like was the way we saw it really the way it all happened? I kept joking with the producer who was with us saying "Please don't make me look like the crazy wife!" he would laugh and say "No, No don't worry" but yes I worried!! It's a show that needed to be entertaining but people will think what they want, and say what they want. Its a risk we took with going on the show, we know the truth and that's all that matters. Take it or leave it...if that makes any sense. How much access does a typical cruiser get to the guys? How much of your access was producer arranged? The show needed a story as any reality show does and we were celebrating our wedding anniversary. But really your on a boat with your favorite music group just have fun because that doesn't happen everyday! I did see Jonathan walking around chatting with fans and taking pics but I'm not the type to push and get in there for selfies. I like to enjoy the moment and let them be comfortable. But really, its all about being at the right place at the right time. Oh and I did see Donnie somewhere on the boat too. Are you friends with any of the other cast members? If so, who? How often do you see them? Yes. We are friends with everyone and with the cast of RTB. We have met some in person and chatted but some just on social media both seasons. Even hung out with a few of them on the cruise the following year. If you could do it all again (being a cast member) would you do it? Why or why not? Yes defiantly. When I was getting filmed cruising I didn't know if it was the beside idea because I was a mess about it. All the "what ifs" and what are people going to say crossed my mind a lot. When it was all done airing as time went on it got easier and no regrets after it was all said and done. If it wasn't for that experience we had we would probably never have any of those moments or get to meet the people we were lucky enough to meet. We've met a lot of amazing friends from all over the world. I'm a firm believer everything happens for a reason. Is there anything you would like to say to “set the record straight” about your experience? No. Not really because not worth it people will think and say what they want to say but we know the truth. If we could do it again we would because now we know what to expect and wouldn't be so nervous and not care what others think. We would Rock That Boat 10X harder! (Augie says) With that being said we would like to thank NKOTB and everyone involved in RTB season 2 for the most unforgettable experience Augie and I had and we wouldn't change anything. Comfortable wear-sneakers etc., flats, comfy clothing. OTC medications for example Benadryl, Advil, motion sickness meds etc. Keep the negativity home! Just be nice. No time for sleep! Enjoy it because the trip goes by fast! What would you say to convince someone who thinks the cruise isn't her jam to go on it? If you can handle partying this is the boat for you. I think everyone if they can get on the boat should try it at least once and they will be hooked. Words cannot explain how amazing the cruise is. It's almost like all your worries and everyday life stresses go away on this trip! It looks like a blast! Is it really that much fun? How often do you spot a New Kid? It is a freaking blast. What you see is what you get. Go with no expectations and just have fun. Our second cruise I don't think we saw any of the new kids around but we did get to rest more than we did our first cruise when we filmed the show. Honestly when you start meeting people you tend to forget NKOTB is on the boat and just go around doing your own thing.